TOMB OF HAFEZ : The tomb of the famous poet and mystic of 8th century Iranian, 14th century western (about 1320-1389) It has a garden with pools, very pleasant, relaxing and restful. Marble tombstone, engraved with the poet's work, placed by Karim Khan in 1773. In 1935, an octagonal pavilion supported by eight stone columns was put over it. It has a small library, a teahouse, and a good souvenir and bookshop. 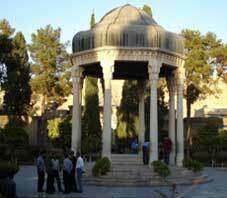 Hafez loved his birth place Shiraz so he refused many generous invitations inside and outside of Iran.